Every January I drive to Bowie, Maryland, to take part in a gaming tournament there. It is a seven or eight hour drive, depending on weather, traffic, etc. 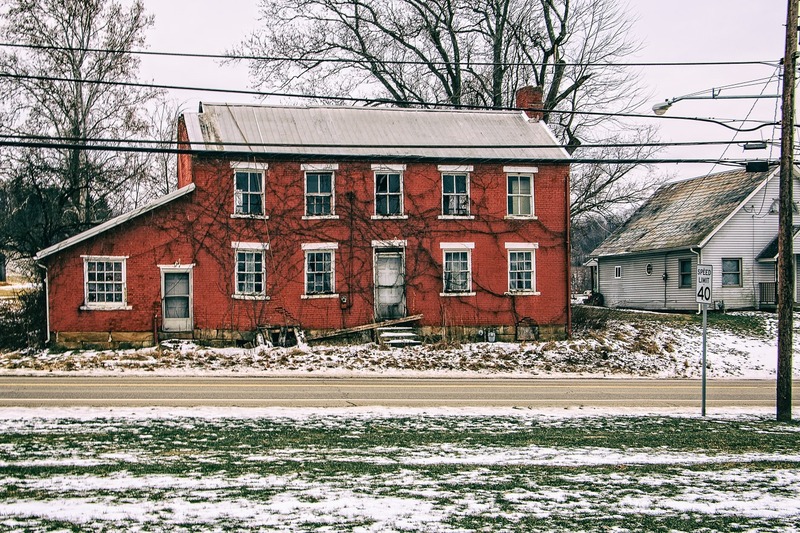 In recent years, I have extended that drive by a considerable number of hours by driving through back country roads until I got to the Ohio border—and only then switching to the Interstate. So on this particular trip, I headed east-southeast across Ohio. 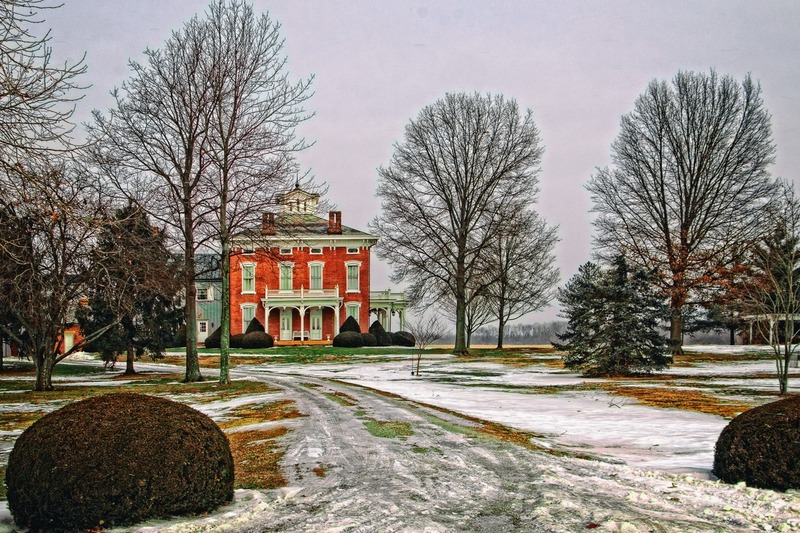 As I headed east away from Columbus, I came across this stately country manor—exactly where, I cannot tell you, as I had forgotten to turn my camera GPS on at this point. It’s an impressive piece of old architecture and nicely kept up. I notice that one front door wasn’t good enough for them—they had to have to. Maybe going in and out by the same door hadn’t been invented yet. East of Columbus is a reservoir called Buckeye Lake because Ohio. There are several little villages that dot the fairly large lake, catering to the recreation trade, for the most part. 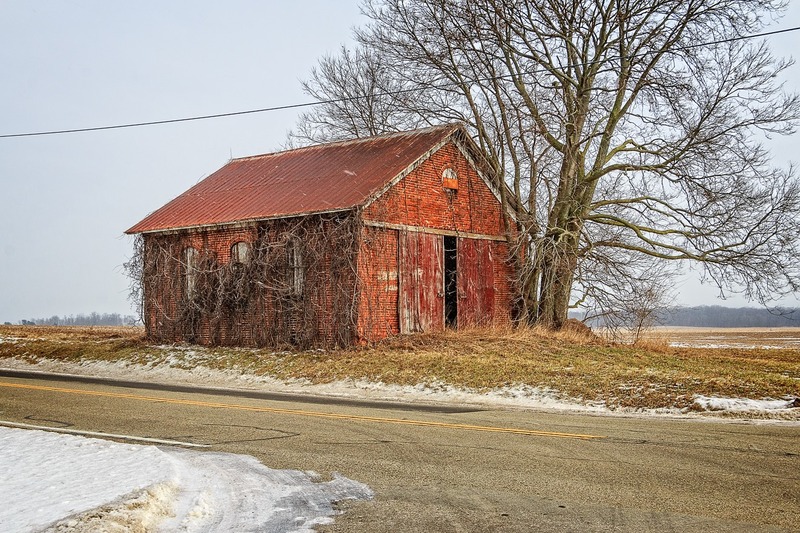 One of those villages is Millersport and south of Millersport is this old one-room schoolhouse, long since converted into a storage shed. In the summer, this building must look quite overgrown. I wonder how many years it has been since anyone dipped a girl’s pigtail into an inkwell? Quite some time, I suspect. 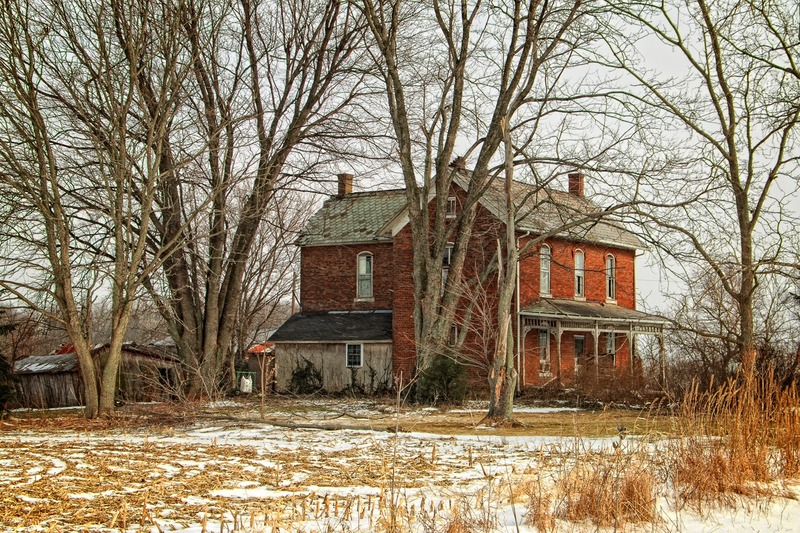 As I continued to head east, on the south side of Buckeye Lake, I came across another old country house, one that has seen a bit more wear and tear than the Stately Manor ™ pictured above. The old house even has an old-fashioned dinner bell (not visible here) that one could ring to bring people in from the fields. 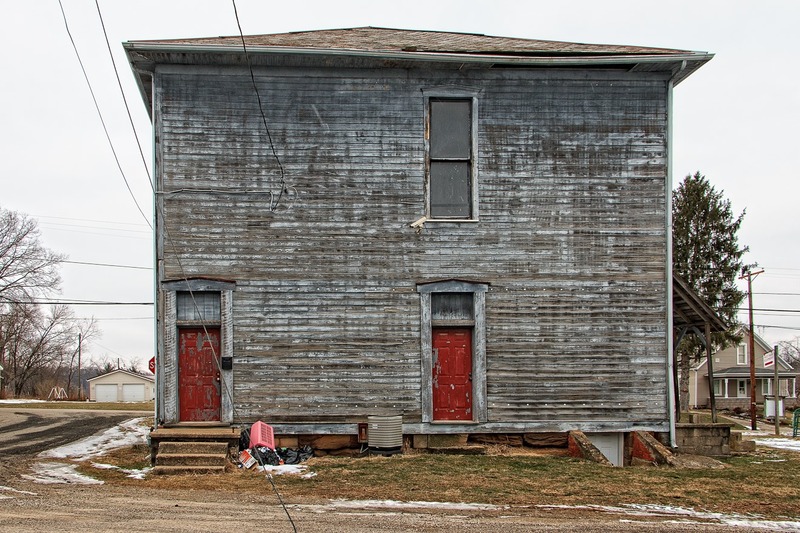 For some reason, there’s an upright piano on the front porch. I did not know this at the time, but this was not a random house. 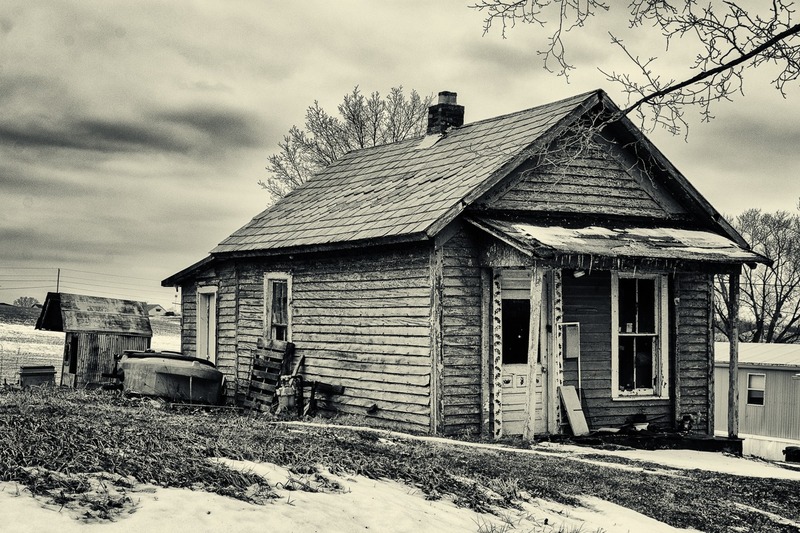 By an amazing coincidence, this is actually the childhood home of my friend and frequent roadside photography travelling companion Tsuki. I would only learn this a year later, when on a subsequent trip she navigated me to her old home because she wanted to take a photograph of it. Almost exactly a year before, I had discovered it on my own. It is a small world. On a hill just up the road from Tsuki’s old house is a very attractive small church, the Zion Reformed Church, which dates back to 1806 (though this present building was constructed only in 1910). The King farm is situated a stone’s throw or so east of the church. 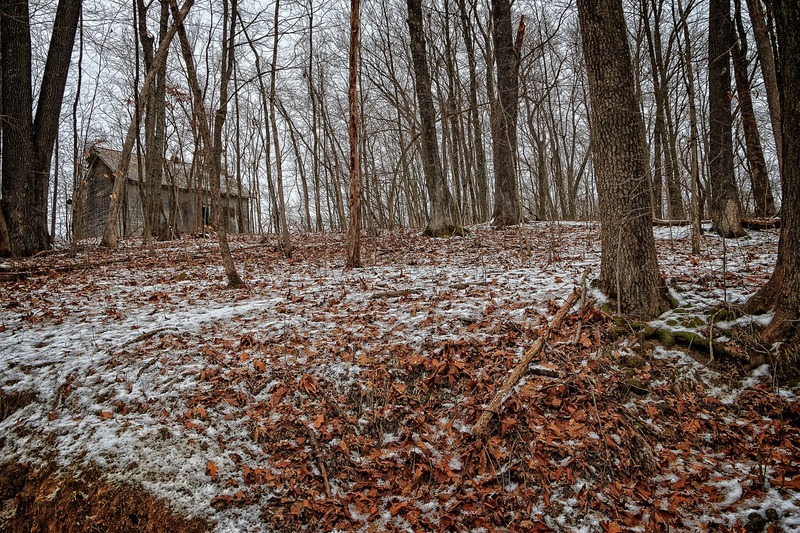 This long-abandoned cabin is situated in the woods south of the hamlets of Fultenham (population 178, salute!) and East Fultenham (unincorporated but seemingly a bit larger). I fantasize that the residents of Fultenham and East Fultenham passionately hate each other. East Fultenhammeranians think that the people of Fultenham put on airs because they were the original, while the Fultenhammites look down their noses on the noveau Easterners. For some reason, I passed through neither Fultenham, but I did journey through the nearby village of Roseville, Ohio (population 1,852, salute!). 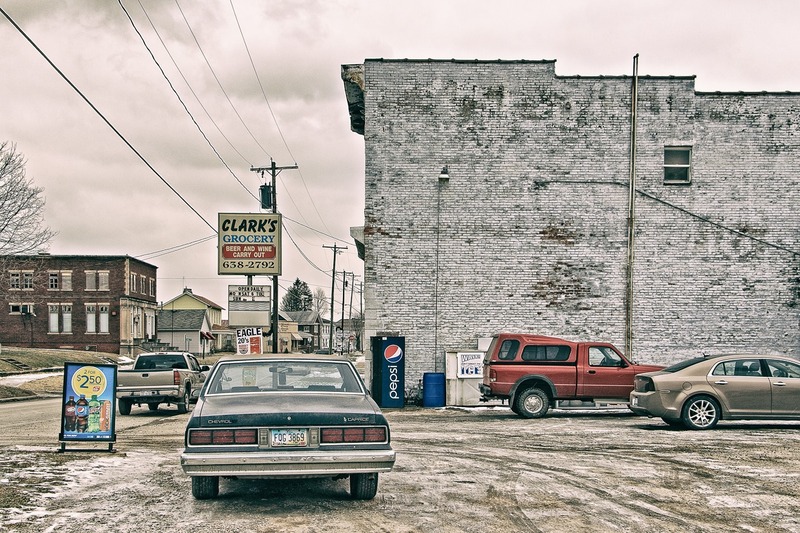 It was an old pottery town, as many places in this part of Ohio were, but its economy has seen better days, as this view suggests. After Roseville, I had to head north a bit, because there are only a few places where there are bridges across the Muskingum River, one of the major rivers in Ohio. 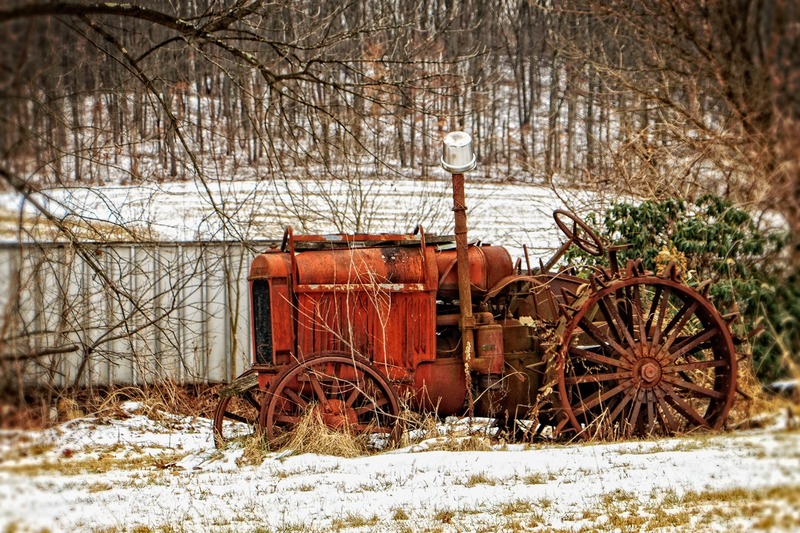 Along the way, I saw this old tractor, long since set to pasture. 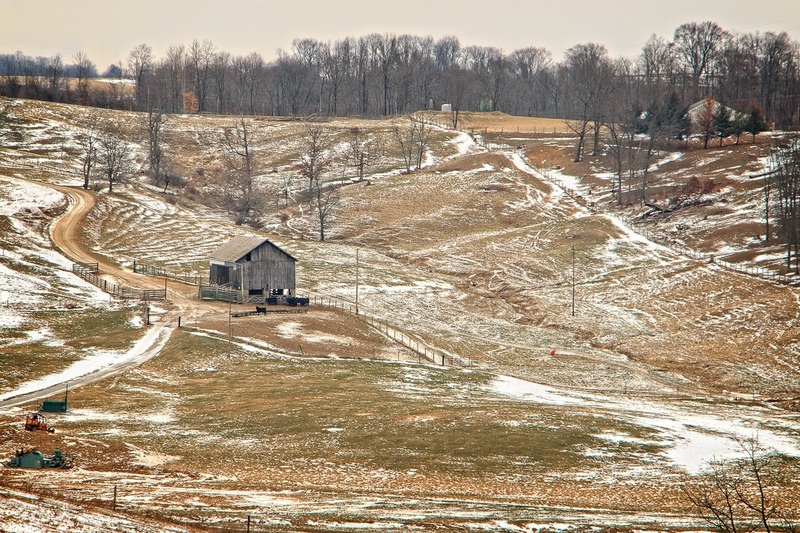 Even a little bit of snow can make a landscape feel cold and desolate, as with this farmscape a bit northwest of the village of Duncan Falls, Ohio. Eastward, ever eastward. 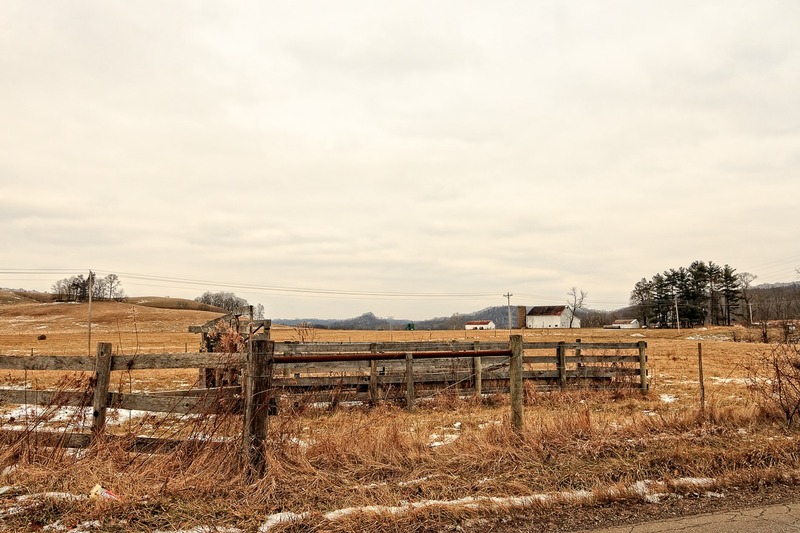 East of Duncan Falls the countryside alternates between hilly farmland, pastureland, and woods. 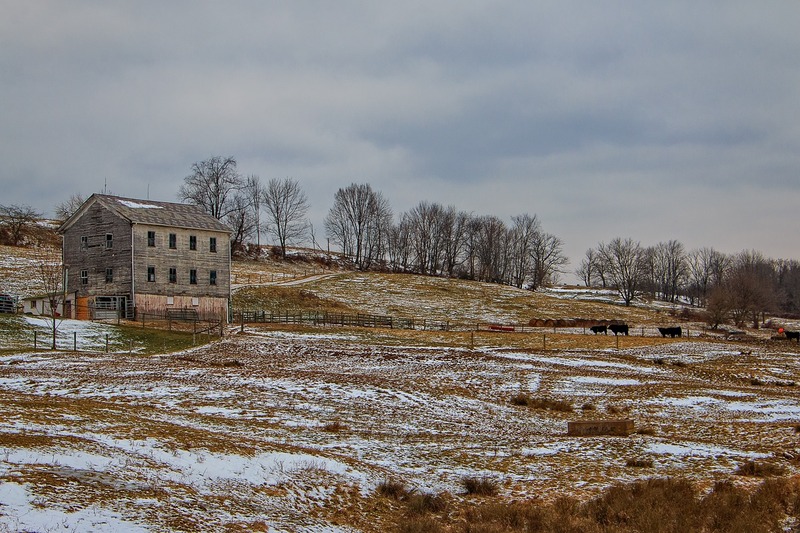 Here a livestock pen stands sentinel for a country farmhouse. The GPS notations on these next few photos seems to have them out in the middle of nowhere, but they were actually taken in a little hamlet—I suspect Chandlersville, Ohio. 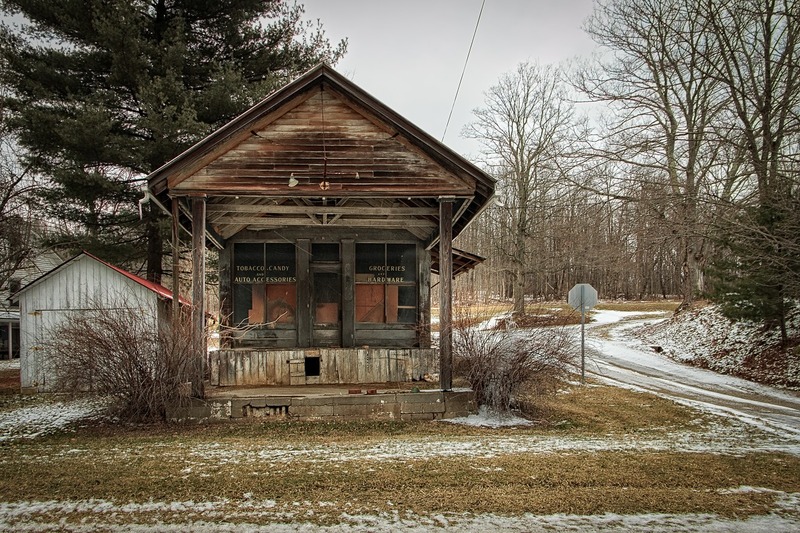 The area definitely has some interesting old buildings. 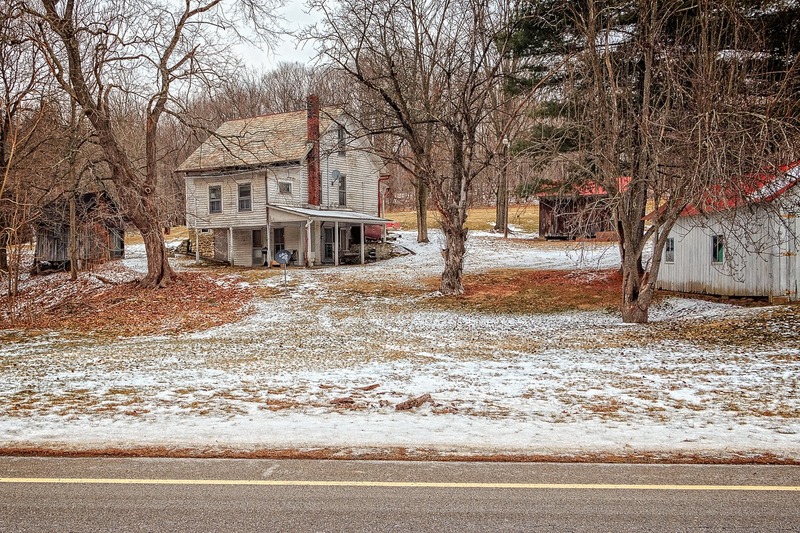 Outside of Chandlersville is this old rural house, but what is interesting about the property is not the house but another building (below). Oddly, I found on-line another photograph of this building which seems to be from the National Archives, though how it got there I can’t say. That photograph was taken some unknown number of years before mine. At that time the side of the building had a sign for something called “Pleasant Beverages,” since removed or stolen. It also had a mailbox with a name and address on it, though not all of it is legible. It seems to read “Mr. and Mrs. _____ Dudley, Rt. 2, Chandlersville.” The first name may possibly be James, but I can’t be sure. 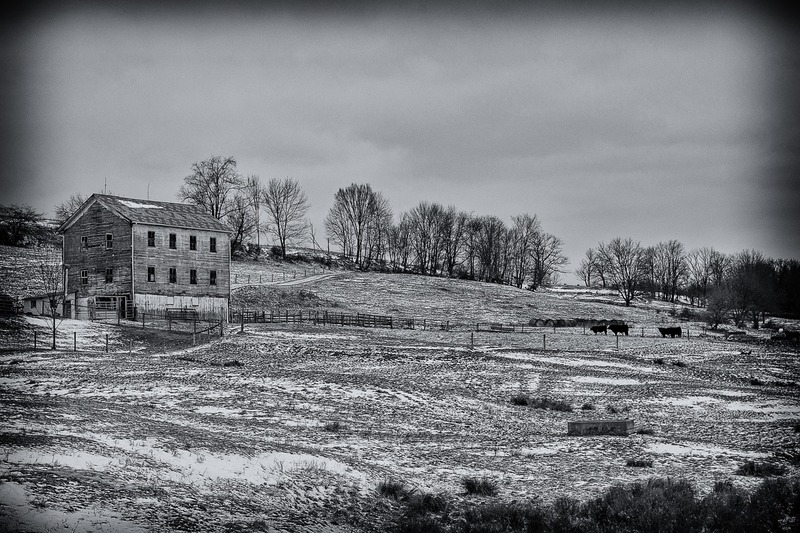 Here is a classic cow barn on a hillside. It looks frigid—and it is. I could not decide whether I liked the image better in black and white or color, so I indulged myself and posted both. Mea culpa. 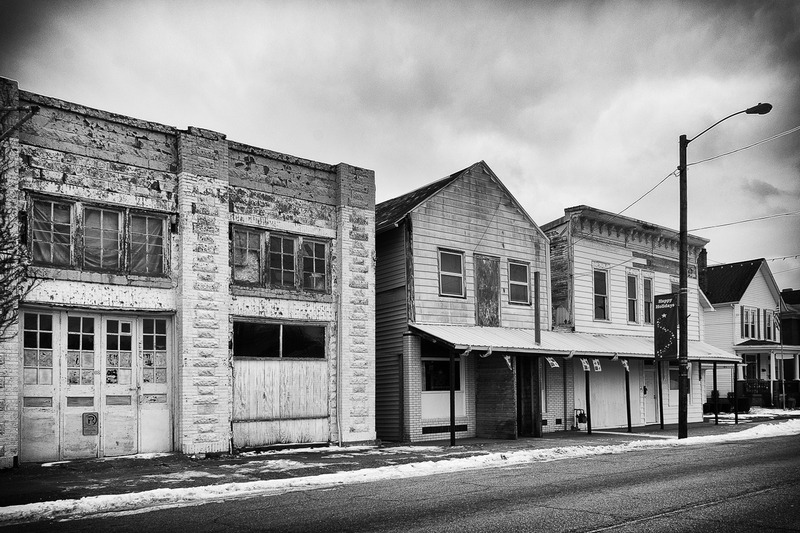 This is Main Street in wintry Cumberland, Ohio, a hamlet of 367 souls (salute!) 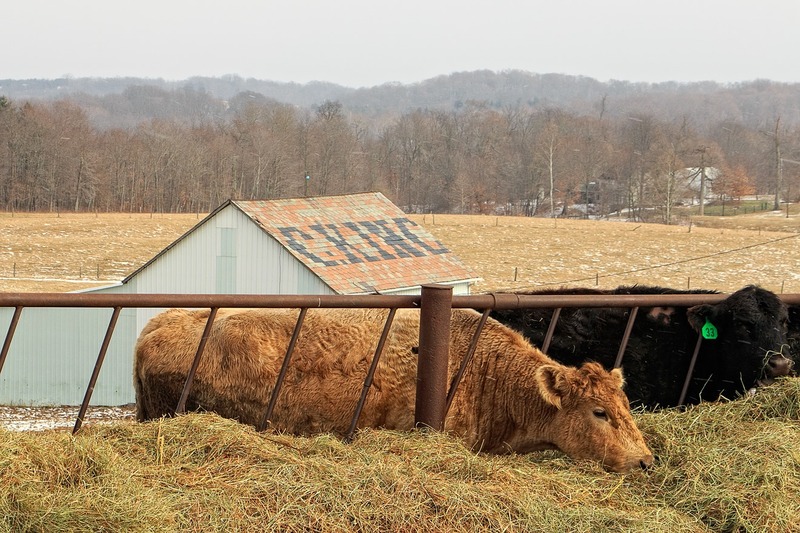 in Guernsey County in the heart of Southeastern Ohio. It is not far from being 200 years old, but it reached its population peak a century ago at 636. 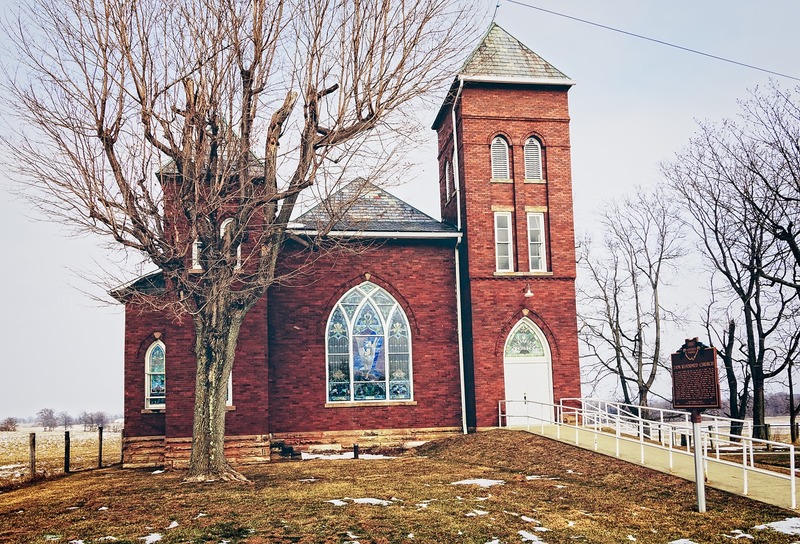 Eats of Cumberland and west of Pleasant City is a stately but non-operating church, Bethel Church (formally, it used to be the Bethel Methodist Episcopal Church). 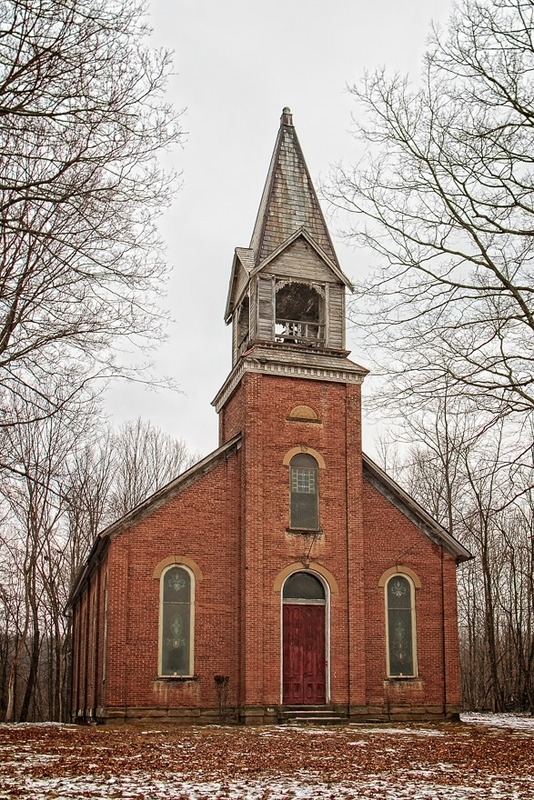 A church had been on that location since the early 1800s; this structure was built in 1873. The church was not used regularly but was sometimes opened up for special occasions. Sadly, in 2005, the church and the adjacent graveyard were heavily vandalized, causing around $50,000 in damage. And that takes us to the end of this particular expedition, but in some ways I have (in my opinion) saved the best for last. 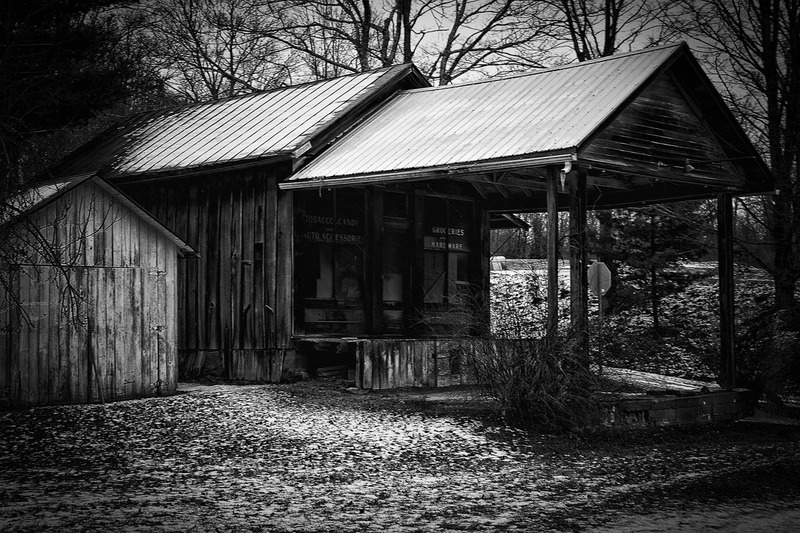 Pretty much in the middle of nowhere, southeast of Pleasant City, I came across a bend in the road and next to the bend was a large shed, like a garage. Inside the garage was I know not what, but outside the garage were a number of old vehicles, from various eras and in various conditions. If you are one of the extremely few regular readers of this blog, then you know that I am fascinated by antique automobiles, so I was extremely pleasantly surprised to come across this location. In my opinion, pride of place went to this 1941 Cadillac Series 62. They didn’t make ‘em like this even when they made ‘em like this. I took some photographs, but there were lots of weeds in the way and the backdrop was not very interesting, so when I got home the next week and looked at my photos, I was actually disappointed. 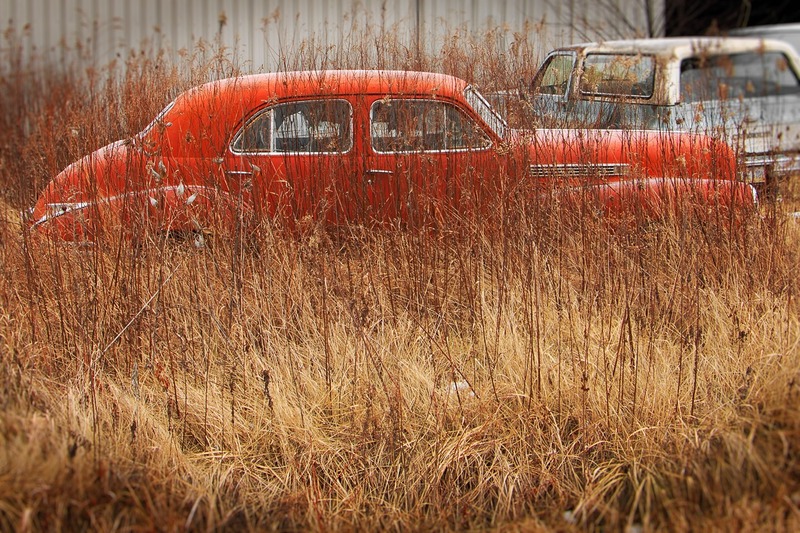 But later, when I began to post-process some of the photos, I realized that with a little strategic cropping on one of the photos, I would actually make the weeds work to my advantage and have a foreground against which the form and color of the Caddy would contrast. The above photo was the result. I make no claim to it being good—I find it very hard to judge the quality of my own photographs—but I do say that it is one of my favorite photographs. Two more cars here. 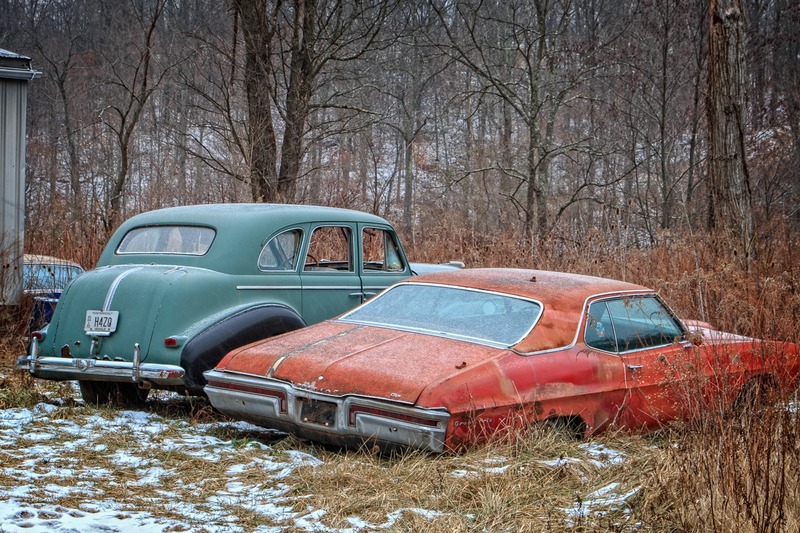 The one on the right is a Pontiac Grand Prix that has seen much better days. The older vehicle, on the left, is of a make and model I cannot identify. It looks like no later than the 1940s. At first glance it looks in better condition than the Grand Prix but when I closely inspected it, I could see it has been sadly neglected. This vehicle and the Cadillac deserve, I must say, better treatment than they are getting.